italk, the psychological therapy service run by Southern Health and Solent Mind attended the Eastleigh Mela at the weekend with a number of special guests. 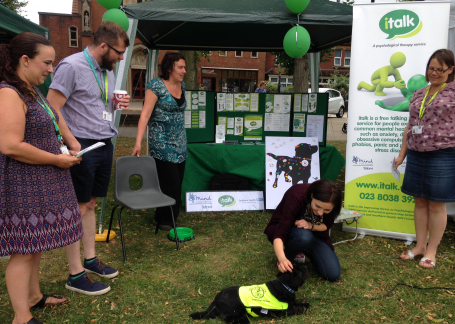 The service, which provides guided self-help and talking therapies for people across Hampshire brought a number of Pets As Therapy (PAT) dogs to help them interact with people at the festival. Therapy dogs are used to help lower stress and anxiety and at the Mela, italk used them as an icebreaker to talk to people about these issues and the services that they provide to help people who might be experiencing problems. With mental health problems being under-reported in many Black and Minority Ethnic communities, italk was at the MELA to help raise awareness amongst the local Asian population. A number of practitioners were on hand to give people advice on the treatments that the service offers and how they can help with problems such as insomnia, stress, depression and anxiety. Using the successful ‘black dog called depression’ theme from the World Health Organisation, the italk stand was fun and interactive with people encouraged to add their ideas on how to beat the ‘black dog’. The team got people at the festival to share their thoughts on mental health, what they feel might affect them and also what they use to help lift their mood. Suggestions included going for a run, listening to music, walking the dog and talking to friends. With mental health still having a stigma attached to it in many communities it was important for italk to be at the festival to help break down the barrier and provide information for those who needed it. Julie Blackler, Head of the Step 2 service at italk said: “The MELA festival was a great way for us to interact with the many different cultures and communities that we serve across Hampshire. It is really important for us to raise awareness of mental health and how to access help if you need it. Bringing the therapy dogs to the Mela was a great way of breaking the ice and starting the conversation about mental health and the ways that we can support people.